Every fashion blogger's dream is to have a professional photographer in tow, snapping photos and making them look fabulous with lens trickery and lighting expertise. Well, I'm one step closer to the dream. Fashion photographer extraordinaire, Harvey Miedreich, was kind enough to take a break from photographing waif-ish, six foot tall models and snap some outfit photos of just plain ol' me. I'm elated! You like? stunning! i love the pleated skirt. I LOVE! Harvey did a great job and you look adorable! Don't you wish we could have a professional photographer at our beck and call? It would make life so much easier! AWWWWWWW! You are the cutest! These photos are GORGEOUS. Harvey is extremely talented. He had a great subject, too! Amen Caroline, it's all her. Wow. I like the classic look. The peachy top is so nice. The lace and the skirt looks perfect together. I am so impressed! Fantastic outfit! Like the colours! Great blog! Follow you now, follow me? You look stunning! 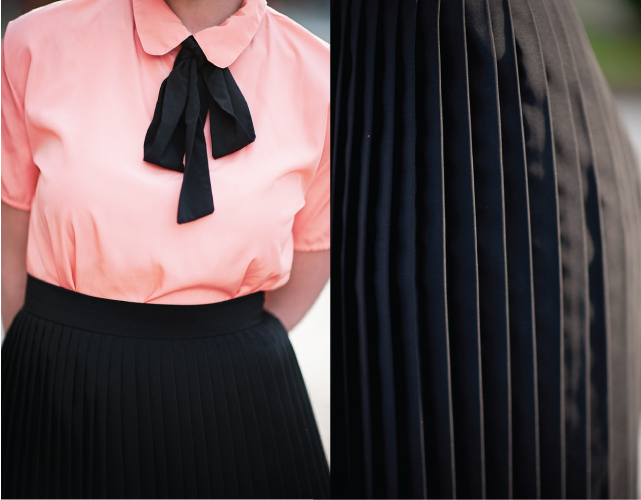 I really love the peach blouse and this pleated skirt!